Origami is an ancient art originated in Japan. But being ancient means no value in real life situation, nowadays there are hundreds and even thousands of ways to change the structure of a simple paper by applying unique fold. Japanese Engineer made a remarkable and ingenious application of their ancient piece of art. From paper origami to steel origami engineering. TOKYO -- Scientists are bringing out the practical side of origami. 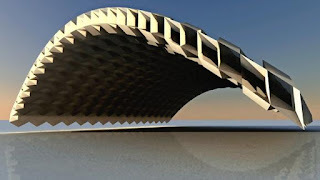 Inspired by the Japanese art of paper-folding, they have discovered structures that are extremely difficult to deform. Besides the obvious potential applications in architecture, these shapes could find their way into robotics and equipment for use in space.